Will Ferrell, left, and Mark Wahlberg in Columbia Pictures' comedy "The Other Guys"
Leonardo DiCaprio's 2 1/2 hour dream epic finally got shaken out of the top spot in the summer box office, after three strong weeks. Comedy cop caper "the Other Guys" trumped the psychodrama with a huge opening weekend, hauling $35.6 million in ticket sales, Reuters reported. 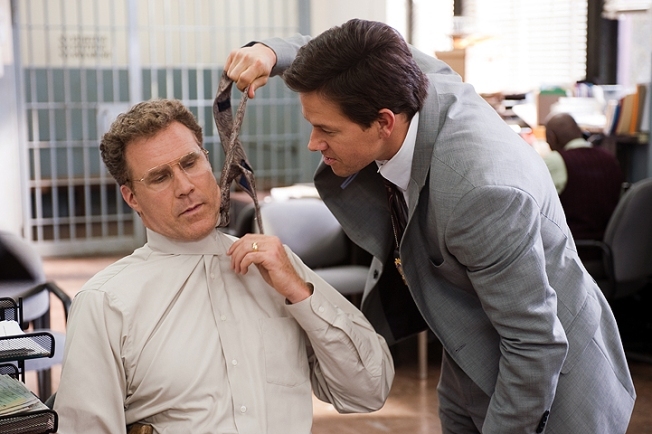 Big name costars Will Ferrel and Mark Wahlberg can both be satisfied with early sales. The last time Wahlberg had an opening weekend this big was all the way back in 2001, when the critical dud "Planet of the Apes" overcame a weak story line to earn $68.5 million in it's opening weekend. Will Ferrel's last two films have been flops, "Land of the Lost" and "Semi-Pro." Despite the strong opening, word of mouth buzz about "the Other Guys" has been mixed, the L.A. Timesreported. Viewers leaving the film gave it an average B- grade, according to CinemaScore, a market research firm. The audience was predominately young and male. Flixster, another film metric measurer, said audiences gave it a 69% positive rating. "Step Up 3D," the other film to open this week, brought in a lackluster $15.5 million this week. This is the third installment of the teen dance movie series, and this opening weekend total is far frome the success of the first movie, which made $20.7 million in its first week. The 3D film also carries a hefty price tag of $35 million, so producers Walt Disney Pictures and Summit Entertainment have a lot of work to do before they get back in black.